My summer was full of fascinating people in a deeply interesting community. My community partners, K-State Research and Extension and LiveWell Finney County, gave me valuable and challenging experiences that stretched my perspective, challenged my comfort zone and inspired new passions and significant personal growth. With K-State Research and Extension, I spent my time helping my supervisor, Dr. Debra Bolton, conduct a public health assessment of Gray County, Kansas. Gray County, according to 2010 Census data, has a population of roughly 6,000 residents and is 16% Hispanic. 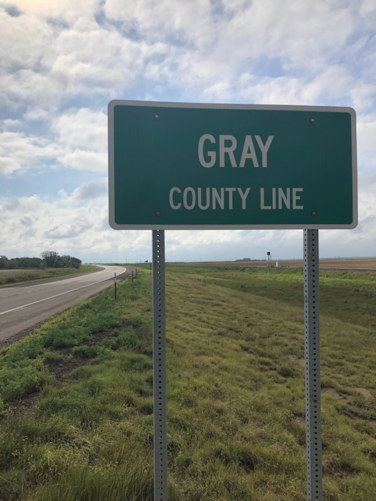 KSRE partnered with the Gray County Health Department to conduct the study with the goal of identifying community assets and needs. The results of the study will be used by the health department to more effectively serve the community. I played various roles related to the study. At the start of my internship, I helped develop the survey instrument. Additionally, to do research on human subjects we needed approval from K-State’s Internal Review Board, so I aided Debra with the IRB approval application. Once our study was approved, I had the interesting responsibility of travelling to Gray County to distribute our survey at various community gatherings, door-to-door, senior centers, and grocery stores. Seeking out survey respondents was a very interesting way to learn about and experience the community of Gray County. 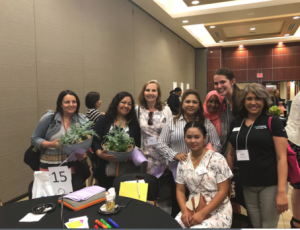 My role with LiveWell Finney County, part of the Finney County Health Coalition, allowed me to experience an organized community-wide effort to improve public health. My first role in the organization was helping with a federal grant application. The Center for Disease Control grant application we worked on would fund community initiatives surrounding the topics of tobacco, physical activity, nutrition, and clinical-community collaboration. My role was to read and report on the Notice of Funding Opportunity, a lengthy 60-page document explaining what projects the grant would fund and the requirements for a complete and successful application. After going through the document, I reported to Callie Dyer, my supervisor at LiveWell, and other staff of St. Catherine’s Hospital about the requirements for the grant and materials needed for the application. Due mainly to time constraints, our team decided to not move forward with submitting the application. Nonetheless, this experience was valuable to me. I was able to read and understand a complex and technical document, draw out its objectives, and give an organized and accurate report to my supervisors. An excellent opportunity I was given was attending the Kansas Community Health Worker Conference in Wichita with LiveWell staff June 14. My second role with LiveWell was teaching three financial literacy classes at the Neighborhood Learning Center. The NLC is located in the Apple Garden Apartments in Garden City, an apartment complex with primarily Burmese and Somali residents. 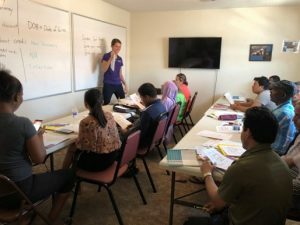 In each class, we learned how to fill out a money order, what credit is and why it is important, and specific options available in Garden City to build credit with no credit or a bad credit history. Each class was taught through translation. I would say the material in English a few sentences at a time, then my words were translated into Burmese and Somali in real time. Preparing to teach this class was a unique opportunity to talk to NLC staff about needs of their students, then subsequently design a curriculum catered to identified needs. Teaching my class was one of my favorite things I did this summer. 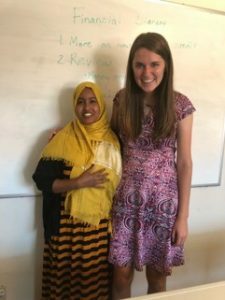 Ifrah is a Community Health Worker for LiveWell and translated into Somali for our financial literacy class. Birgit is the director of the Neighborhood Learning Center. I learned a lot from her, and she was a joy to work with. From my work with both community partners, I learned so much and developed valuable new skills. I started the summer with goals of what I wanted to learn and skills I wanted to gain, as I described in my second blog. I did achieve my goals of communication, networking, and organization. 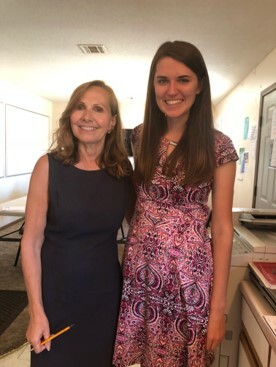 However, as my supervisor Debra patiently helped me realize throughout the summer, I found that deciding what I wanted to learn from an experience before the experience begins can be counterproductive. I began to learn the most when I came to work ready to learn from whatever I encountered that day, not just the experiences that fit in the objectives I had preset for myself. An example of what I mean: I came to Garden City with a desire to serve underprivileged populations through teaching financial literacy. When I found that teaching financial literacy would only be a small part of my internship, I was significantly disappointed. Much of what I did ended up being health-related. This focus on health did not match the preset goals I had made for myself prior to moving to Garden City. During the first weeks of my internship, I had hard and frustrating days because what I was doing was both outside my comfort zone and not what I wanted to be doing. Sometime in the latter part of June, I began to let go of my preset goals and embracing the health-related work I was doing. I committed to learning from what was set before me. Through many candid conversations with Debra and other colleagues, I began to learn that caring for the human person is too complex to put into checkboxes. To effectively serve underprivileged populations, I learned it is important to be attentive and responsive to their complete lived experience. My internship gave me an excitement and confidence for my future as a young professional. I went to Garden City with an interest in working in a rural community, but I left with a passion for it. My internship showed me that I have an ability to thrive as a young professional in a rural environment. 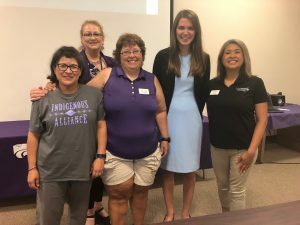 I saw there is opportunity for me to have a meaningful career in Southwest Kansas, and my work this summer gave me a network of professional connections that will be helpful in searching for a job next spring. Senior year of college is a time of uncertainty and change, and after my experience this summer I am going into the year with alleviated anxiety and a confidence that I have meaningful assets to offer my community in the present and for years to come in my career. From left to right, at my harvesting ceremony: My incredible supervisor, Dr. Debra Bolton, Kayte Fulton with St. Catherine’s Hospital, Donna with LiveWell, myself, and Karen with LiveWell.